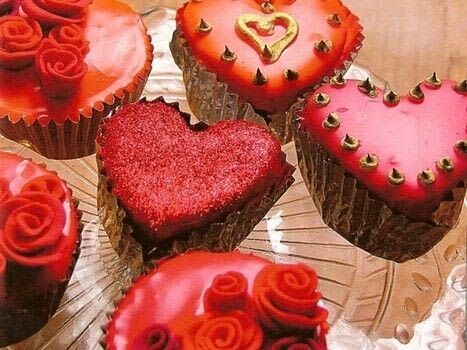 Desirable cupcakes, perfect for your lover. I have one word here: "silicone" - the most wonderful invention in the world of baking tins (pans). They are just fantastic. You don't need to line them or even grease them. For these cupcakes, you really do need to invest in a silicone heart-shaped muffin tray. Preheat the oven to 170'C/325'F/Gas mark 3. Sift the flour, sugar and baking powder in to a bowl, food processor or mixer. Add the margarine, eggs and vanilla, and beat until pale and fluffy. Spoon the mixture (batter) carefully into the silicone muffin tray, place on a metal baking sheet and bake in the oven for about 20 minutes, until golden and firm to the touch. Let the cupcakes cool in the muffin tray, then turn them out onto a wire rack. Slice the tops off the cupcakes so that you have a level surface and turn the cakes upside down. You want to ice the bottoms of the cakes. Make the glace icing and tint whatever colour your heart desires (sorry). Drizzle the icing all over the cakes and let it run down the sides. Before the icing is completely dry, lay out all your metallic cupcakes cakes (baking cups). Dip your fingers into a bowl of cold water, then lift the cakes onto the cases - this stops the icing sticking to your fingers. Carefully mould the cases around the hearts, and the cases should stay put. When the icing is completely dry, pipe decorations onto the cakes in royal icing. Let that dry. Mix some edible lustre with a few drops of vodka, and paint onto the royal icing. Alternatively, you could paint the entire top with edible glue and dip into glitter. Woo-hooo! Those cupcakes look gourmet, and they need tone in a shop window! I am getting just hungry looking at them,yum! wowza! Those are some fabulous cupcakes! My birthday is on Valentine's day, so I can't wait to try this! Are you missing something in this recipe? I made it exactly how you said but I got a dough, definitely not a batter. yum! these are gorgeous looking! I will have to invest in some of those silicone baking pans. thanks for the tip on that... =) hope you're having a CRAFT-astic week! Looks way too pretty to eat! ...mamma mia me sta a venì fame!! (This is "Romanaccio"..in English it would be "...mmm...mom i'm gettin' really hungry!!!"